Google Summer of Code (GSoC) is a global program focused on bringing more student developers into open source software development during their holiday break. The Document Foundation and LibreOffice participate every year, and we are happy to announce three accepted projects aimed to improve usability. Special Characters are an important feature in LibreOffice. However, some enhancements are required to make the Special Characters dialog competitive. In particular, it’s very tedious today to find the right character, which should be solved by a dedicated search field. The UI will follow proposals that have been made some time ago. Welcome, Akshay Deep! Figure 1: Current state and planned result. The Notebookbar was introduced last year as an alternative to the classic toolbar. Since than, many improvements have been made, but some functionality is still missing. In this project, it is planned to complete the window resize implementation to handle cropped content, to fix theming issues, to add missing UI controls, to support mouse gestures, and other missing features. Welcome, Gökhan Gurbetoğlu! Figure 2: Different variants of the Notebookbar. 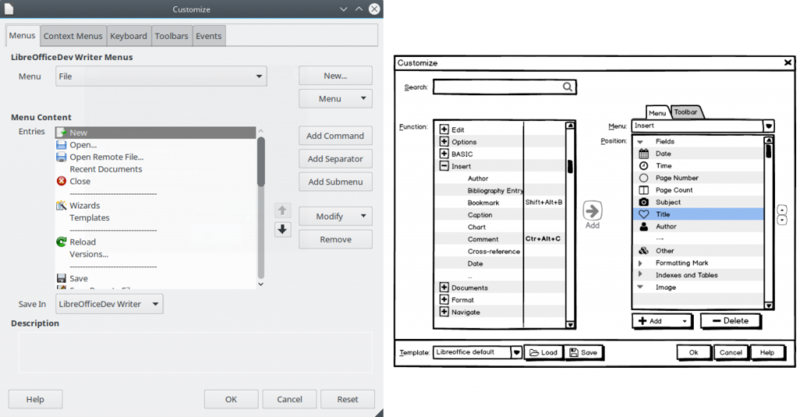 The Customization dialog allows users to customize toolbars and menus, and currently lacks a number of features. For instance, it is not possible to search for a particular function. It also has an interface that focuses more on technical facts rather than ease of use. With a redesign following this proposal, users will have a better user experience as they customize the program to their needs. Welcome, Muhammet Kara! Figure 3: Planned improvement to the customization dialog. Of course, the mockups as shown here are not definite. We start now with the work and in case of inconsistencies or an unclear state, the design may change accordingly. Finally many thanks also to the honorable mentors Katarina Behrens, Thorsten Behrens, Jan Holesovsky, Szymon Kłos, Samuel Mehrbrodt, Yousuf Philips, and Heiko Tietze. In inserting a special character, it would help a lot if I could freehand-draw the character and LO could offer the most relevant characters that look similar. That is, it would be nice to do what http://shapecatcher.com does. The Recently Used list is something I really like. However, the old Characters list is also handy if I want to enter more special characters after each other. Would it be possible to keep both if them? @Csongor, an interesting proposal. Maybe you should file an improvement request for that?